Although many visitors get by on moussaka or kalamari almost every night, there is a huge range to Greek cuisine, its wonderful mezes, seafood and juicy olives, are among local dishes you must try. The atmosphere is always relaxed and drinking is traditionally meant to accompany food, though a range of bars and clubs exists. 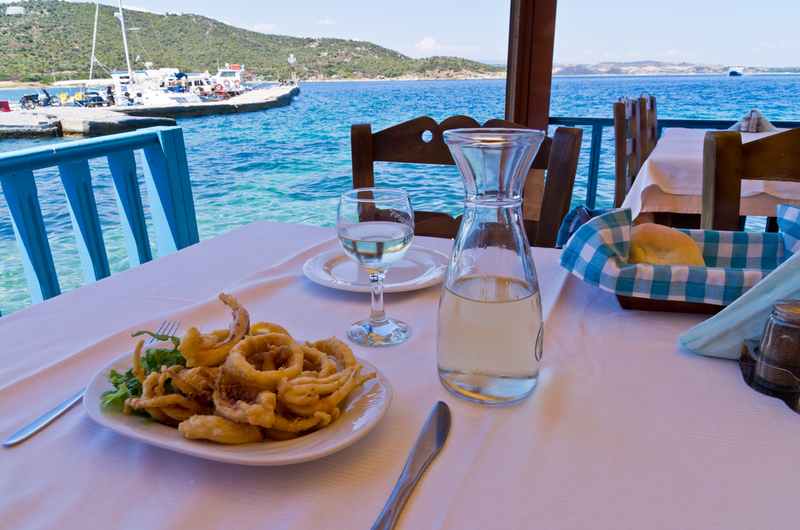 Eating out is a national activity in Greece. For an informal snack, try an ouzeri, where you can join locals for small platters of savory appetizers and a glass or two of aniseed-flavored ouzo. Visit a mezedopolio to feast on a selection of tasty mezes (similar to Spanish tapas) which you might accompany with a flask of raki (a potent spirit made from distilled grapes) or a carafe of hima wine (locally produced wine). For a more cheerful meal, try a taverna, serving generous portions of traditional Greek favorites, often in a rustic setting the best ones have open log fires and stage occasionally live music. A psarotaverna is a tavern that specializes in fish and seafood. Last but not least, an estiatorio is a full blown restaurant, where service will be a little more formal and the menu will probably include a choice of both Greek and international cuisine, as well as quality bottled wines. Greek food tends to be very simple, rarely involving sauces but with full use of local seasonal produce, olive oil and charcoal grills just as people have been eating in outlying villages for many centuries. However, Athens and some of the more fashionable islands such as Santorini and Mykonos have seen the arrival of fusion cuisine and so-called modern tavern fare (involving lighter dishes with more subtle flavors and artistic presentation). Restaurant hours are normally 1200-1500 for lunch and 2000-2400 for dinner. Opening hours vary according to the region and local laws many establishments in popular holiday destinations stay open all day through the summer. Waiter service is usual. Those with a sweet tooth should head for a zaharoplasteio (cake shop), where a vast array of syrup inspired goodies such as baklava and slices of chocolate-coated cakes like Black Forest gateaux are displayed behind glass counters. You can choose pieces individually and then have them put in a box to take away if its a gift they ll tie it with a brightly colored silk ribbon. Best way to discover Greece & Greek cuisine is via our carefully selected range of yachts.